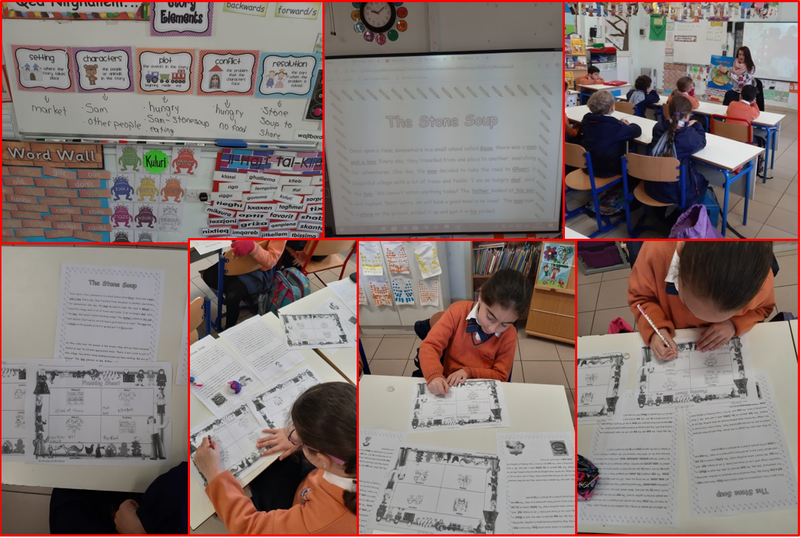 The teacher animated the story Stone Soup . Students also enjoyed animating parts of the story. Then, the class discussed the story elements. 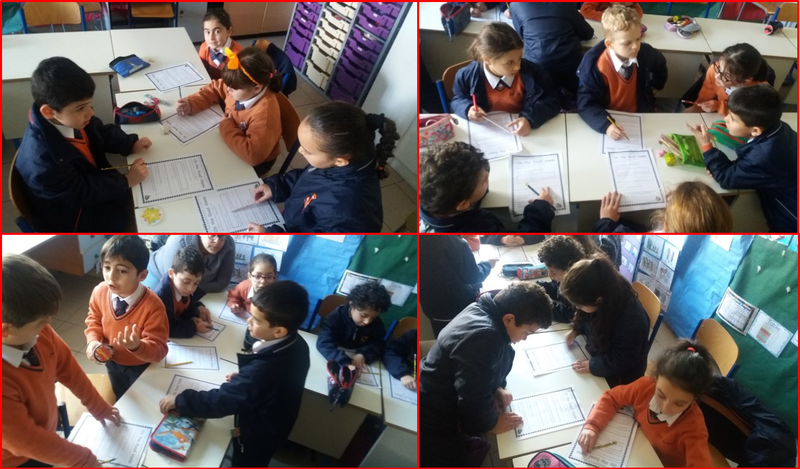 Afterwards, students were given a template of a plan with pictures and they wrote the characters, the setting of the story etc…Another plan was given, this time they had the question words or phrases only so that they could modify some parts of the story from the previous plan. In so doing, the students made the text more interesting and relevant to them. Finally, they were given the text of the story in the form of a paragraph and they had to change the underlined text according to their second plan. During reading sessions students not only draw their favourite scene and character but they also write why. 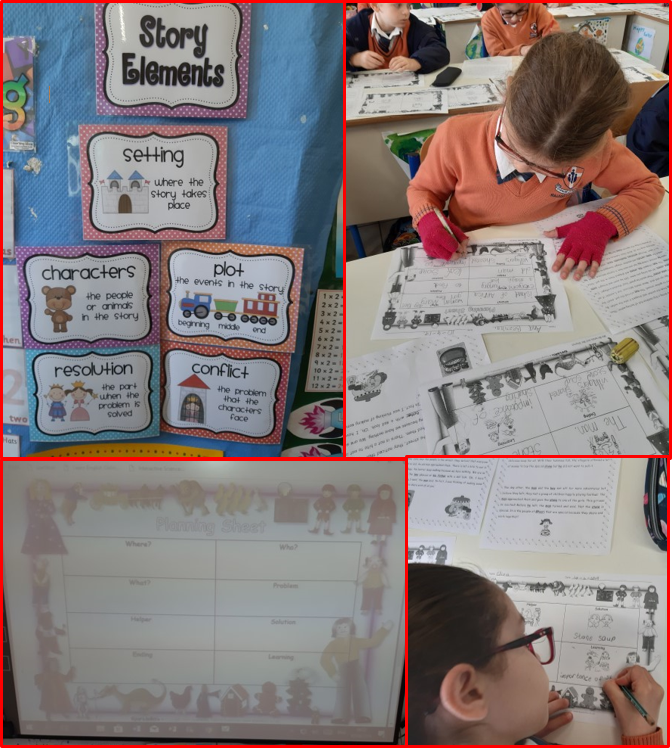 This entry was posted in Year 3 and tagged literacy day on 16 April, 2019 by mgarrprimary. Another plan was given, this time they had the question words or phrases only so that they could modify some parts of the story from the previous plan. In so doing, the students made the text more interesting and relevant to them. Finally, they were given the text of the story in the form of a paragraph and they had to change the underlined text according to their second plan. During reading sessions students not only draw their favourite scene and character but they also write why. 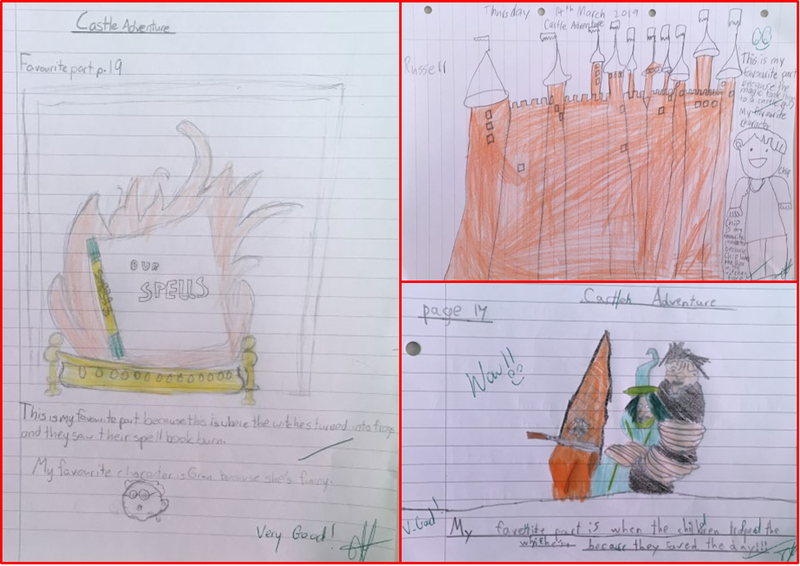 This entry was posted in Year 3 and tagged literacy day, world book day, yout on 13 April, 2019 by mgarrprimary. 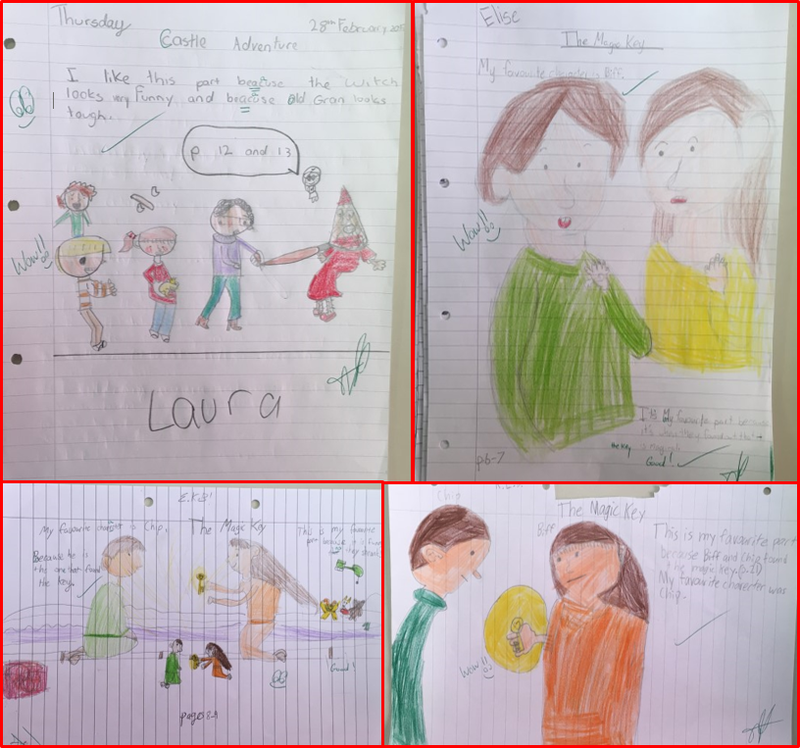 During reading sessions students drew their favourite scene and character. 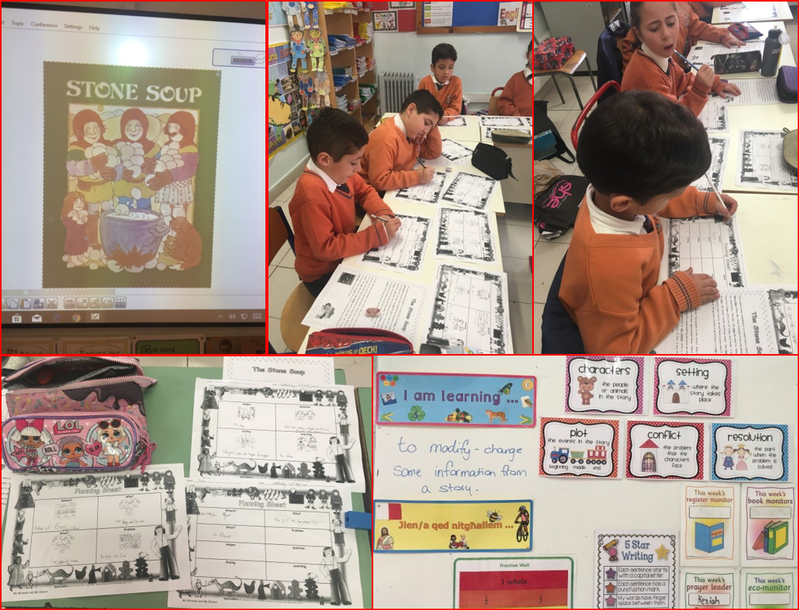 Later the teacher animated the story “Stone Soup”. Students were given a template of a plan with pictures. Students wrote the characters, where the story happened etc. Then, they were given another plan, this time with the question words or phrases only so that they could modify some of the points from the previous plan. Finally, they were given a text in the form of a paragraph and they had to modify the underlined text according to their 2nd plan. 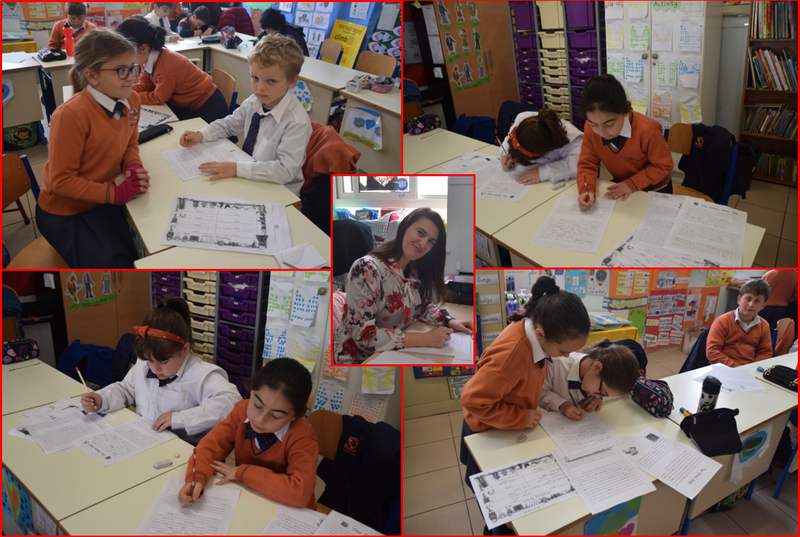 This entry was posted in Year 3 and tagged literacy day on 11 April, 2019 by mgarrprimary. 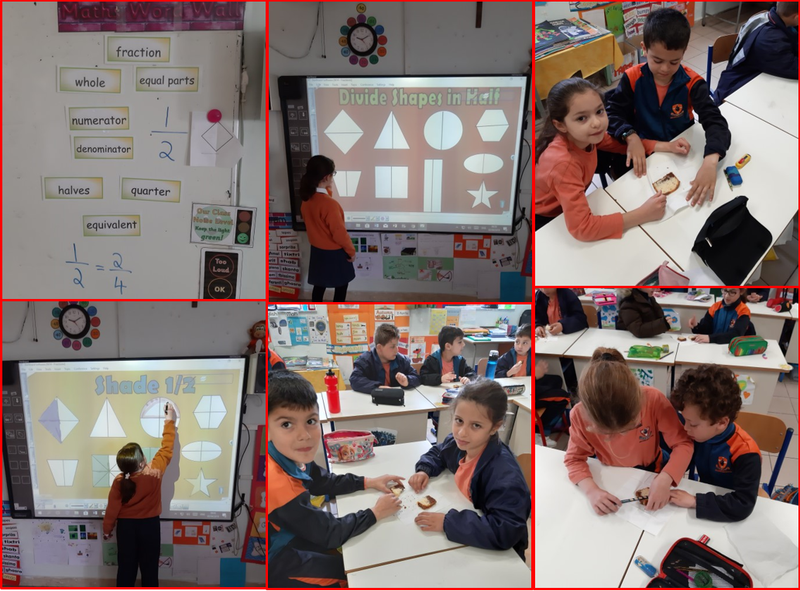 The year 3.1 students had tonnes of fun with fractions! A rectangular cake was used to explain the concept of a whole as well as that of parts of a whole. The students were also given a piece of cake between two and they had to figure out how to cut it in order to have an equal part each, thus cutting it in half.They also watched a video, used visuals, took part in activities on the interactive whiteboard to divide a shape in two equal parts as well as shade one half of the shape and they also used flat shapes to fold into equal parts. 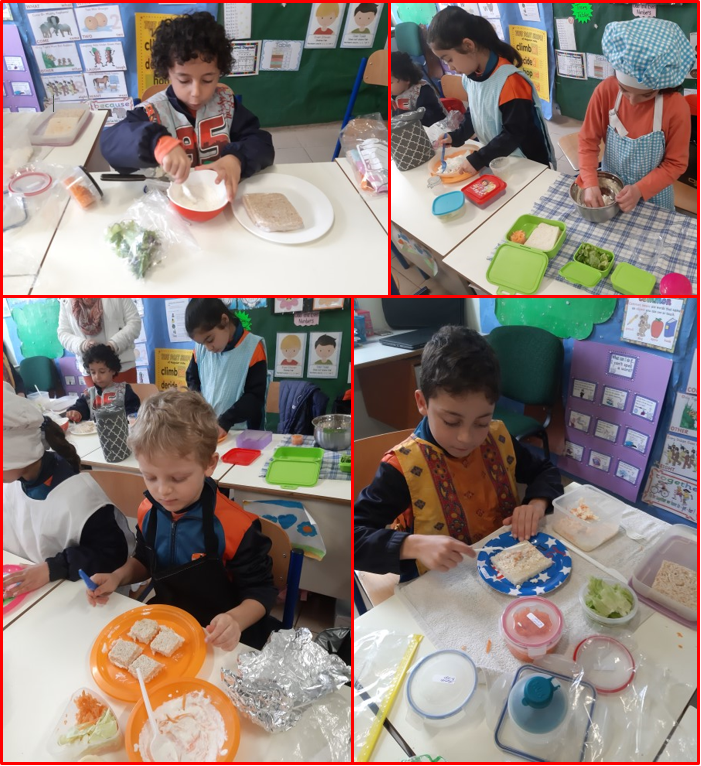 Later on in their fun fractions journey, the students took part in a cooking session to learn about quarters. They prepared a healthy snack. 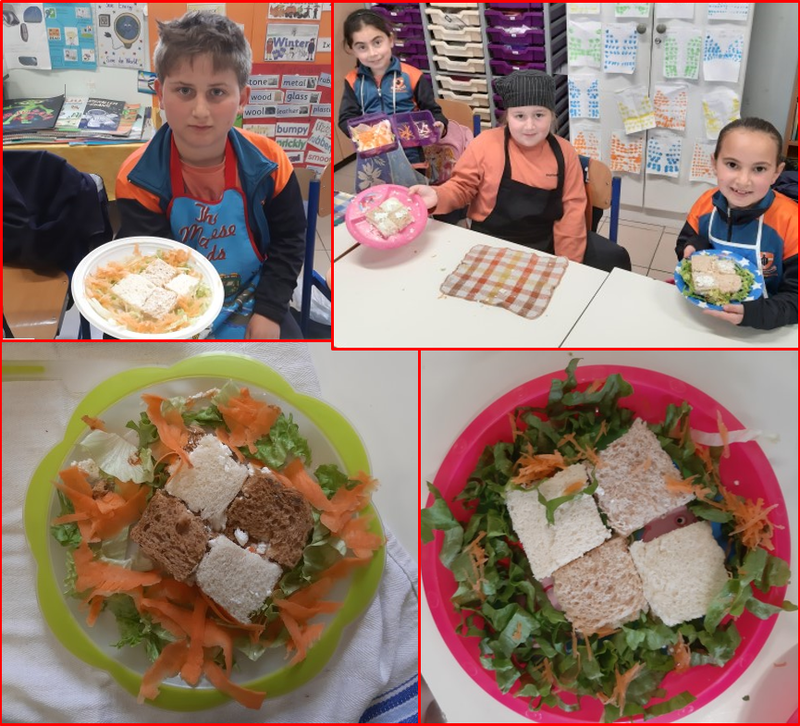 They followed the steps in our recipe to make a ricotta, carrot and lettuce chessboard sandwich with brown and white bread. They cut their sandwich into quarters by cutting it in half first and then, in half again, thus also learning about equivalence i.e. 1/2 = 2/4. This entry was posted in Year 3 and tagged fractions, maths on 4 April, 2019 by mgarrprimary. 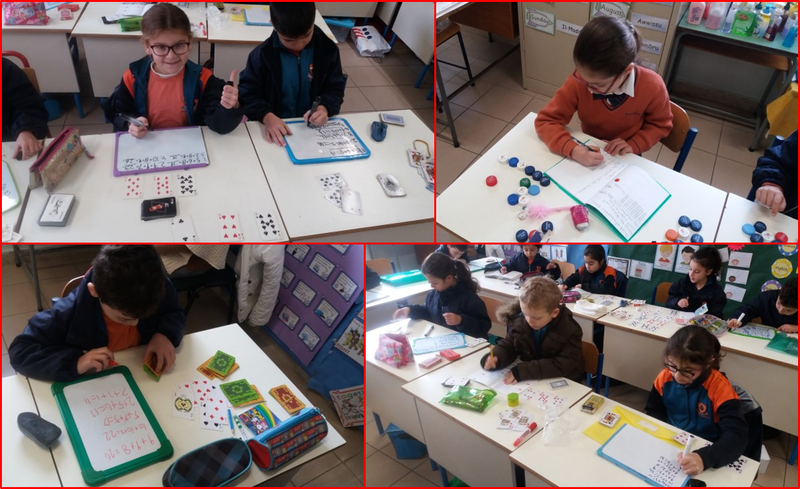 After learning about money, recognising coins, adding and subtracting money and learning about change, the year 3.1 students turned their classroom into a shop. This gave them the opportunity to practice what they learned in a fun way. They discussed what they wanted to buy in a group setting, agreed upon a budget, ‘went shopping’ in our class shop and mentally calculated how much change they should be given. The students were also presented with other hands-on problem solving situations involving money that included the use of receipts, tickets and menus. This entry was posted in Year 3 and tagged money, problem solving, shopping on 4 April, 2019 by mgarrprimary. 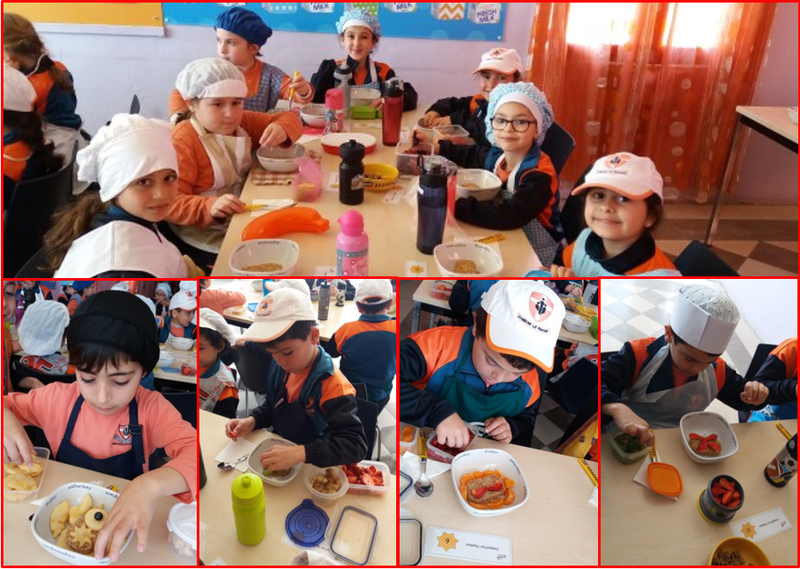 The Yr 3 students visited the Home Economics Centre in B’Kara. There they participated in various activities to learn what a healthy breakfast consists of. 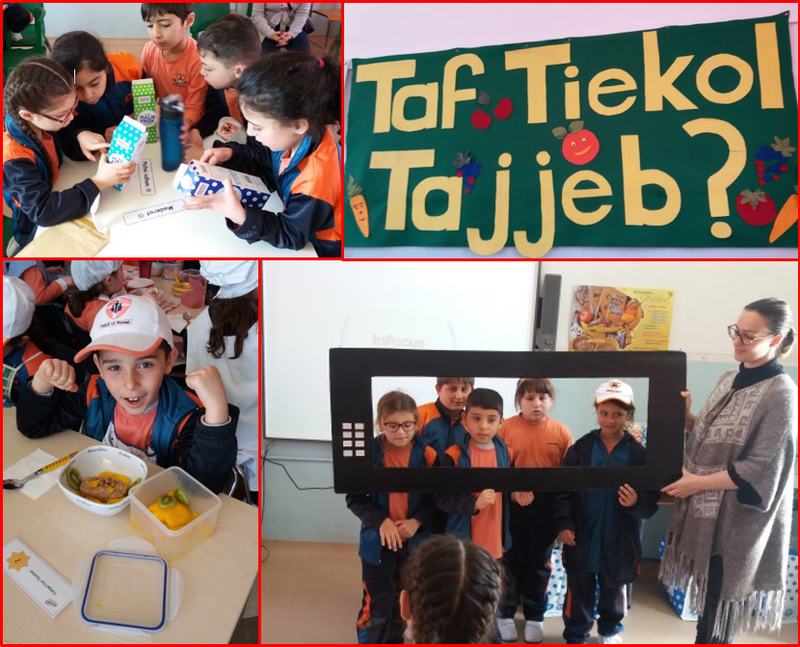 They started off by watching a short sketch about the importance of breakfast in the morning and how to choose the healthiest cereal among the variety of cereals available.The students then made their own breakfast which consisted of weetabix with milk. They also decorated their breakfast with fresh fruit. In doing so, they participated in a contest for the best decorated breakfast. Later, the students learned about the different food groups and participated in games about healthy food. After that, they invented a slogan to encourage people to eat healthily and have a healthy breakfast. Finally, the winners of the contest were given a book in recognition of their abilities. 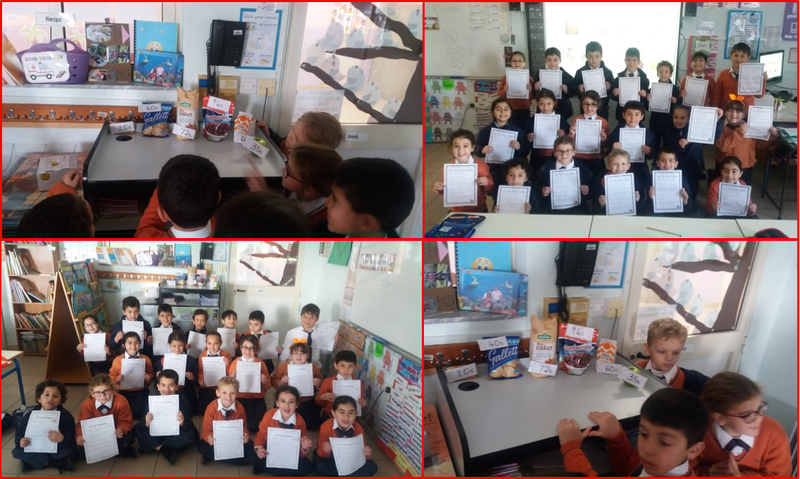 This entry was posted in Year 3 and tagged healthy breakfast on 4 April, 2019 by mgarrprimary. 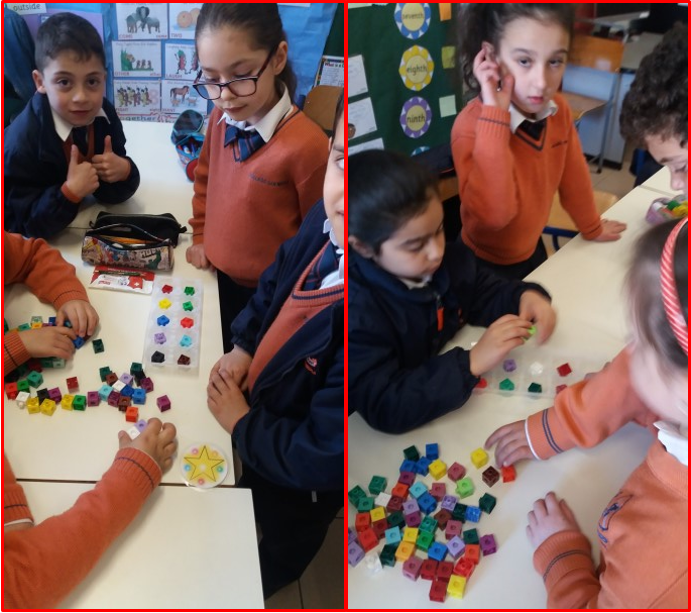 Year 3.1 students had a blast learning the x2 table by means of songs, visuals and hands-on activities. This entry was posted in Year 3 and tagged maths, x2 table on 4 April, 2019 by mgarrprimary. 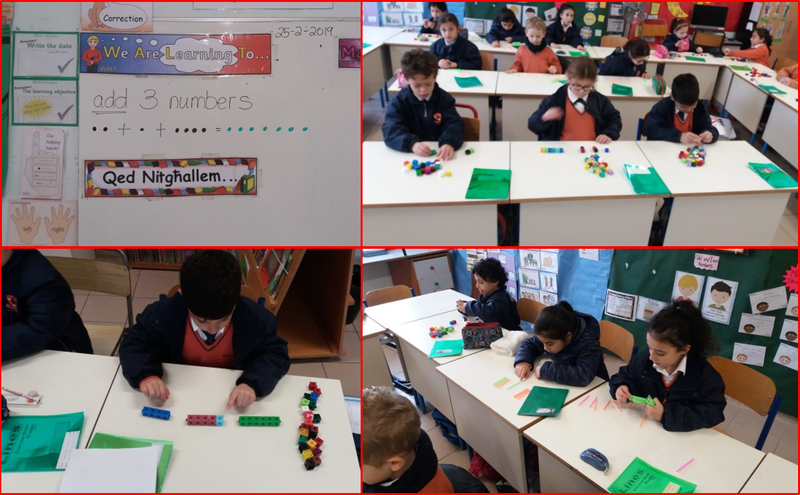 Yr 3.1 students learning how to add three numbers. 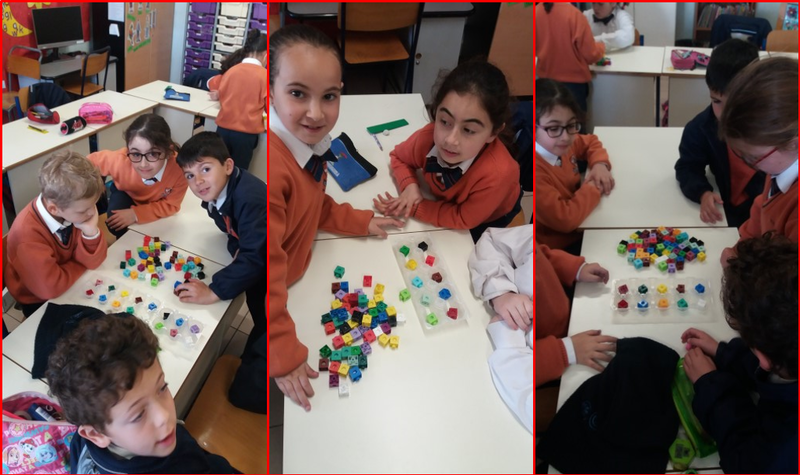 First, they participated in investigations where they made different amounts with cubes, straws and caps. Then, the students drew shapes as pictorial representations of three different amounts and counted the total. Finally, they moved on to numerical representations of addition sums by means of a game with playing cards. This entry was posted in Year 3 and tagged adding 3 numbers, maths on 4 April, 2019 by mgarrprimary. 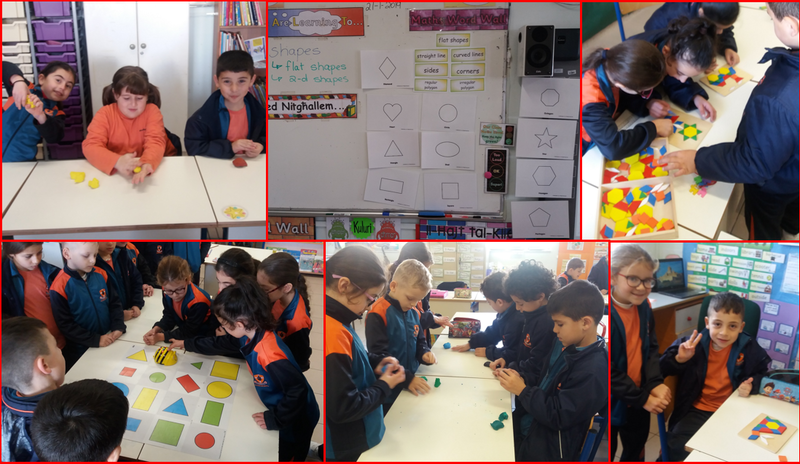 The Year 3.2 students have been learning about flat shapes and their properties. Students were shown different plastic shapes and they had to try and guess their names. 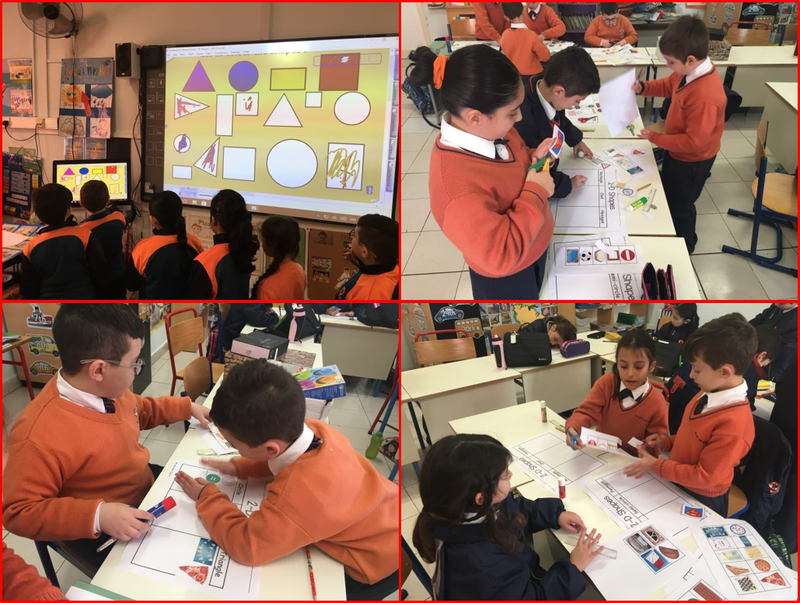 The properties of various shapes were discussed and the related vocabulary and pictures were stuck to the classroom whiteboard. Then, students had to take a closer look around the class and write down what shapes they could see on their mini-whiteboards. They also played various games on the interactive whiteboard. During another lesson students were presented with a PowerPoint Presentation, where they had to try and guess the name of the flat shape that was partially hidden. 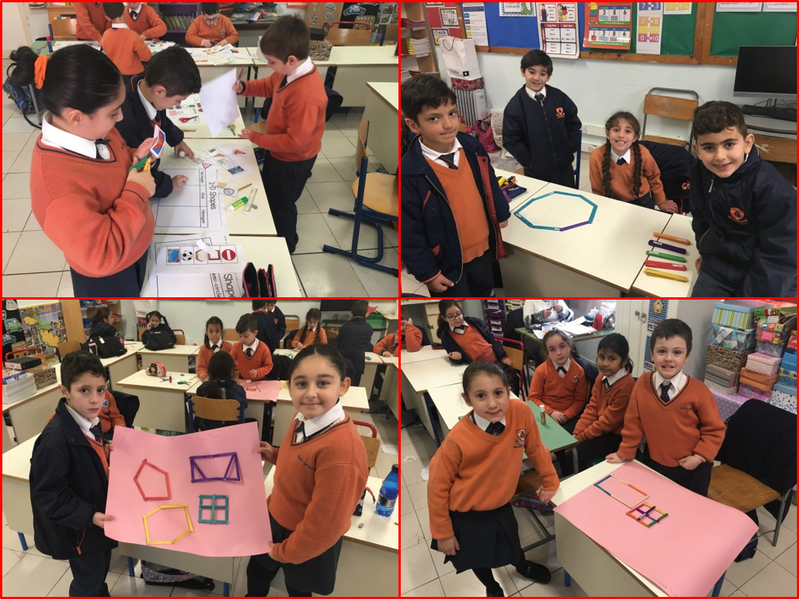 Divided in groups, students created flat shapes using lollipop sticks from their Maths Toolbox and sorted real life photos of shapes according to their category. Furthermore, they listened to clues given by the teacher and programmed the Bee-bot to move on the correct shapes. Mirrors were also used to find out how many lines of symmetry each shape has. 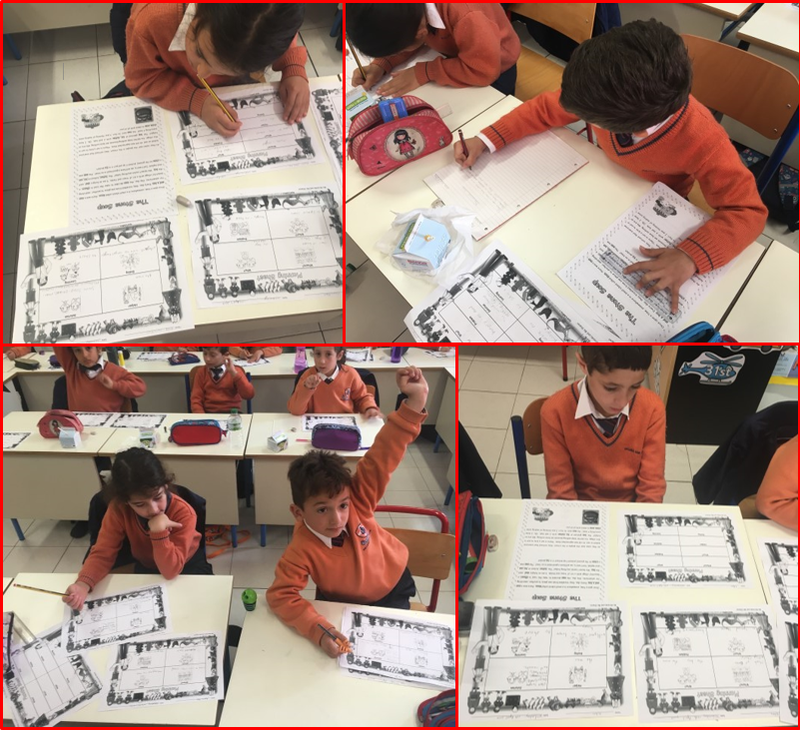 Finally, during a PE lesson, each group of students listened to clues (properties of shapes) given by the teacher. Then, they had to guess the shape and make it using their own bodies. Students had a blast! This entry was posted in Year 3 and tagged 2D shapes, maths on 17 February, 2019 by mgarrprimary. 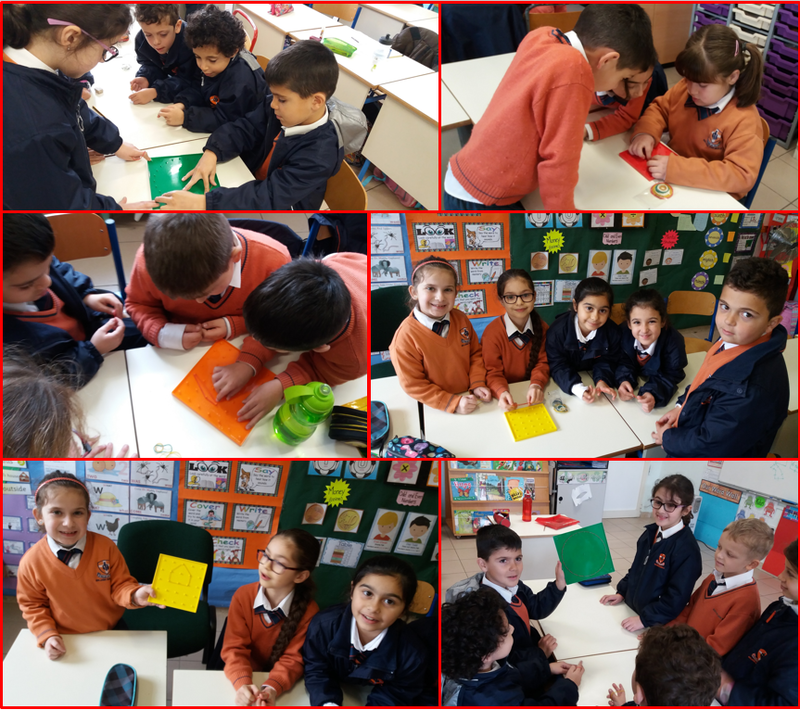 It was so much fun for the year 3.1 students to learn about flat shapes and their properties. 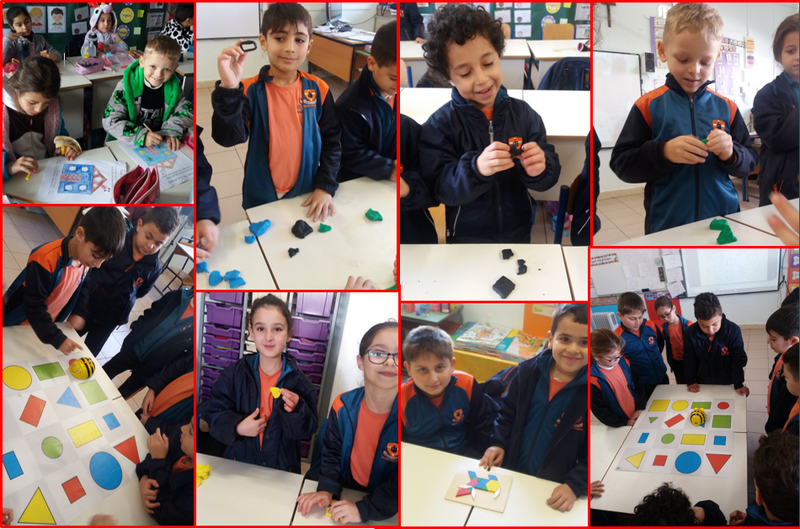 After singing along to the 2-d shapes song, the students participated in a discussion about finding 2-d shapes in real-life objects found in their everyday lives. The students made flat shapes with play dough and formed shapes on geometric boards too. They had a blast making shapes and pictures with parquetry as well as colouring a house made from different 2-d shapes. 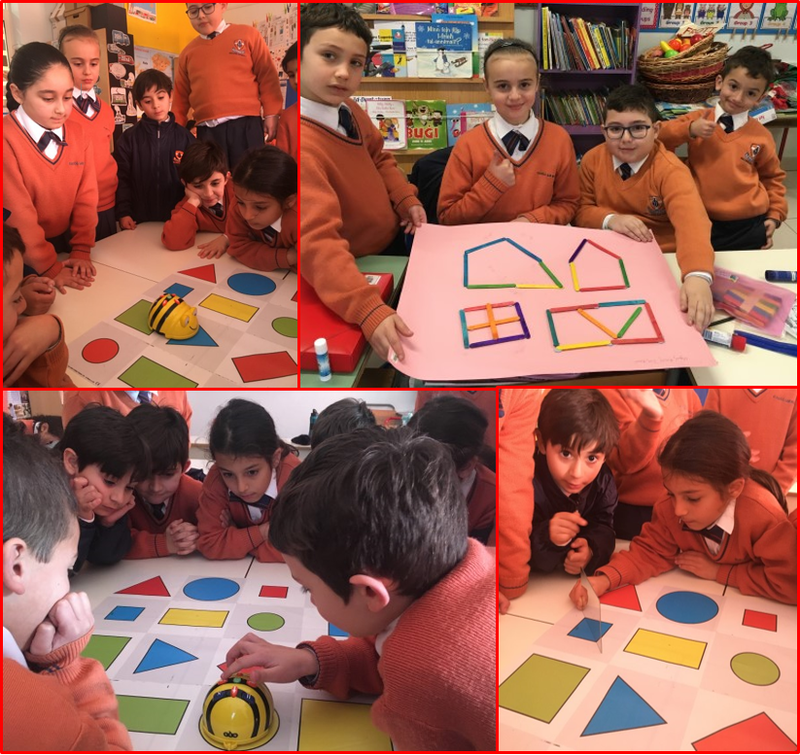 Finally, the students listened to clues given by the teacher and then, they moved the Bee Bot on the correct flat shapes. 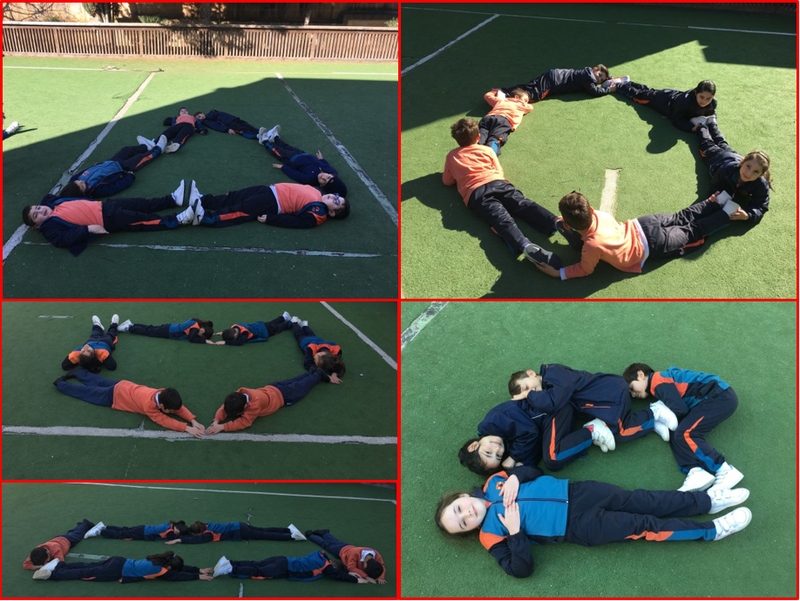 This entry was posted in Year 3 and tagged flat shapes, maths on 5 February, 2019 by mgarrprimary.